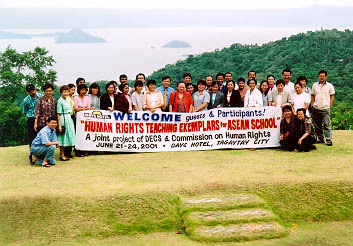 Twenty-six participants composed of teachers, education researchers, curriculum developers and NGO workers from Cambodia, Indonesia, Malaysia, Philippines, Thailand and Vietnam gathered in the Philippines on June 19-27, 2001 for a writing workshop (writeshop). The participants wrote human rights curricular frameworks and lesson plans. The idea of an ASEAN writing workshop was agreed upon in the 1999 Southeast Asia Pilot Teacher Training Workshop organized by the National Human Rights Commission of Indonesia, the Center for Human Rights Studies (PUSHAM) of Universitas Surabaya and HURIGHTS OSAKA. It was held in Bali, Indonesia. At that time, only the Philippines seemed to have undergone writing workshops to develop lesson plans on human rights. It was therefore agreed that this Philippine experience should be shared with educators in the ASEAN countries through a writeshop. By 2001, Indonesia and Thailand have produced their own human rights lesson plans on various subjects. Vietnam added more modules in its set of modules on civics education that cover human rights. The Malaysian human rights commission, on the other hand, shows keen interest in developing materials for human rights education in schools. The ASEAN writeshop therefore is as much a training on writing human rights lesson plans as a sharing of experiences in making them. It aimed at developing human rights teaching guides for ASEAN schools. Participants were expected to draft sample teaching guides for elementary and high school levels focusing on basic concepts and principles of human rights and contextualized in each country's culture, beliefs and practices. In this regard, the principle of universality of human rights was emphasized. The writeshop also aimed to serve as a venue for ASEAN human rights educators to share and exchange experiences in teaching human rights in the formal basic education system. To strengthen linkages among educators in Southeast Asia involved in human rights education in schools. It has been observed that there are various interpretations of the concept of integrating human rights into the existing school curriculum. On one hand, it can be the citation of human rights concepts in civics education subjects while emphasizing the duty to serve one's country rather than the fulfillment of one's rights. On the other hand, it can be straightforward discussion of human rights in the context of issues facing the children. Testing of the drafted materials can be done in the respective countries to determine how they suit the existing school curriculums. Human rights concepts that relate to the core values. The second document is the lesson plan. A common format for lesson plans was also adopted. This format, while following standard lesson plan format, has additional elements that integrate human rights concepts into the subject. The drafted documents were then presented to all participants and commented on by a panel of educators. The members of the panel gave observations on the objectives, materials for use by the teachers and students, the procedure for teaching, and the core values and human rights concepts involved. Each member of the panel was later on assigned to assist a country delegation in improving the drafted lesson plans. After the initial set of human rights curricular framework and lesson plans were developed, the participants went on to make more lesson plans for other subject areas in their curriculum. Each delegation was requested to make eight lesson plans as final output. But due to time constraint, some delegations were not able to develop all the eight lesson plans. At the end of the writeshop, forty-two lesson plans were prepared. The lesson plans were still in draft form. They were subject to review, revision and testing in the respective countries. The delegations that have not developed eight lesson plans submitted the remaining lesson plans after the writeshop. To allow interaction between the participants and the students and teachers, a teaching demonstration was held in primary and secondary schools in Manila. Some delegations prepared a lesson plan for the teaching demonstration exercise. There was an initial apprehension about language. Participants thought that their English might not be understood due to their accent. As the teaching demonstration experience showed, the students interacted very well with the participants. Language was not a problem. All participants appreciated the teaching demonstration experience. They were happy to find out that the students were enthusiastic in discussing human rights. They also realized that human rights, as a subject matter, is not new for the students. The schools involved (Aurora Quezon Elementary School and Manila Science High School) are "effective" or highly rated public schools in the Philippines. The students were found to be smart and able to interact easily with the participants. Thus the future challenge is in testing out the lesson plans in less "effective" schools or with "ordinary", underprivileged students. A report on the proceedings of the writeshop will be published in the fifth volume of Human Rights Education in Asian Schools. This report will include some of the human rights teaching guides developed. A separate compilation of the human rights teaching guides will also be published. This publication will be used in the follow-up activities under the project. The Philippine Department of Education, Culture and Sports (DECS), the Philippine Commission on Human Rights (CHR) and the Asia-Pacific Human Rights Information Center (HURIGHTS OSAKA) jointly organized this writeshop. Financial support was provided by the Southeast Asia Fund for Institutional and Legal Development (under the Canadian International Development Assistance program), and the organizers.